Launched as a mid-season replacement in January, 1996, Otherstream was originally called Planet SOMA and chronicled the life of David, a thirty-something curmudgeon and sexual libertine. Set in the bars and backrooms of San Francisco’s South of Market Area, but also broken up by frequent vacation episodes shot on location around the country, the series was enormously successful at first. Its star found his new notoriety and recognition somewhat baffling–if also rather flattering. A spinoff, Otherstream, was launched in 2000 and the new series ultimately stole the thunder and creative energy of Planet SOMA, which was cancelled a few years later. Most of the cast eventually moved to Otherstream. Otherstream took a decidedly domestic turn at the beginning of season 6 in 2001, with the introduction of a new character, The Hyaena, who would later become known as Mark Arsenal. The entire season centered around the couple’s courtship, resulting in their cohabitation beginning in season 7. In a very special February sweeps episode on 16 February 2004, David and Mark were married in an act of civil disobedience in San Francisco’s city hall. Fan reaction was mixed but generally positive. 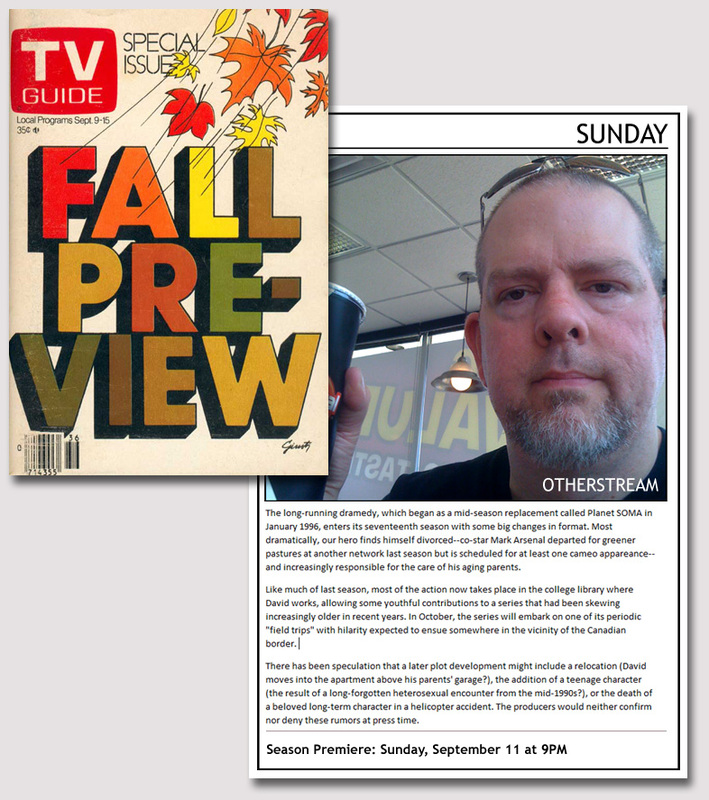 At the end of Otherstream’s tenth season, a series of format changes began, many of which left viewers somewhat confused and bewildered. First, the show’s setting was moved to the suburban Southeast–to Charlotte in 2005 and Winston-Salem in 2006. Ostensibly to keep up with the massive investment in new sets and facilities, Mark Arsenal’s role in the series was reduced; he still appeared in most episodes, but often only via telephone as his character had moved back to San Francisco part-time. Seasons 13 through 15 centered on David’s return to graduate school to study library science, another surprise that was generally popular with viewers even though it diminished the series’ edge somewhat. Late in season 15, David became a full-time academic librarian and much of the action shifted to his new workplace. This change also introduced a youthful element to Otherstream, whose audience had aged with the series, making its demographics less appealing to advertisers and some viewers. In one of the more bizarre and surreal format changes, the setting of the show was also expanded during this time to include several episodes a year set in Pittsburgh. In a desperate attempt to bring some new romantic energy to Otherstream, Mark Arsenal returned as a full-time character late in season 15, a move which coincided with the growing emphasis on David’s workplace. Unfortunately, the chemistry was no longer there, a victim of creative differences and lapses of communication at the network level. In another very special episode that aired 9 March 2011, David and Mark tearfully ended their nearly ten-year relationship as Mark left the series permanently for greener pastures on another network. Since then, the series has struggled to find its voice and its place in the world. The creative force behind Otherstream was determined not to follow the example of Funky Winkerbean and let depression and personal drama completely dominate the series. While the producers briefly considered pulling the plug late in season 16, Otherstream is back for a 17th season starting this fall. Is it simply inertia or is it through the sheer will of the star that it continues no matter what? Will the series resort to still more bizarre plot twists and radical format changes? Another location shift is reputed to be in the offing as some recent episodes have focused on David’s efforts to sell the house in Winston-Salem. The producers will not comment on whether the house will actually be sold nor whether any sale would result in yet another significant format change. As long as someone tunes it, it seems, there will be some flavor of Otherstream available, if only in syndicated reruns. Now entering its 21st season. Otherstream has shifted locations to Greensboro, having focused on family drama. David’s new career, and most recently the exhausting sale of the house in Winston-Salem, which was profiled in a series of episodes entitled “Kafka@Home.” With its twentieth anniversary set for January, 2016, Otherstream has made peace with its changing formats and declining audience and has found a certain new stability, aided by Twitter and other media. Who knows how much longer it may last? still interesting to follow. the time it has lasted is amazing. so many self episodes have occurred. illness, lost of family, aging, gosh aging, what my mother never told me.